Pacific Horizon Financial, Inc. | Notes and Comments from the Staff at Pacific Horizon Financial, Inc.
A recent article in the San Diego Daily Transcript by economist Alan Nevin, discusses the rising inequality in our nation. Alan says “….The inequality is being exacerbated by the marriage of college-educated people to other college educated people. The incomes of the educated rise rather rapidly as they move up the job scale and together, they provide the disposable income that creates the Beemer economy. They can afford the nice cars, nice housing, travel, upscale clothing and can raise their children in the manner that will inevitably lead to those children’s high level education. At the other end of the scale, we have the folks who most often made it out of high school, but whose learning capacity is dulled by making the mistake of being born to the wrong parents and by the mediocre education they have received. If these young adults cannot meld their education with today’s increasing technology driven jobs, they are destined to be at the bottom of the economy indefinitely. And when they marry, they inevitably marry at the same socio-economic level, thereby ensuring a lifetime of struggle. According to a recent Harvard/Berkeley report, 70% of people born into the bottom quintile of income distribution never make it into the middle class. And less than 10% make it into the top quintile. The study notes that social mobility has been low for at least thirty or forty years. Therefore, the spread between the educated and undereducated continues to widen. Other studies indicate that Millennials, typically 1st time buyers, are showing less interest in buying houses and cars. Many prefer to live and work in urban areas and can actually get by without a car. Add to that the psychological impact of the great recession, maybe a huge student loan to pay off, and the freedom of location spawned by technology, you can envision legions of well-educated urban gypsies. Many can work from any location with good cell and internet coverage. So what is a real estate investor or lender to do? Given that urban gypsies won’t be living in tents, they still need lodging, and those on the other end of the scale need housing as well. Urban apartments, condo’s and upper scale furnished rentals all look like a good bet. At the lower end of the scale, individual homes are slated to become long term rentals, and it appears that there is a need for larger apartment (as in square feet per unit) communities designed to house families for the long term. This is all good for the Beemer’s in the short run, but it is not good for our society in the long run to have the middle class eliminated and it certainly appears that is what’s happening. Federally insured Certificate of Deposits (CD) have traditionally been a comforting option for conservative investors. As long as the FDIC is solvent and your savings are not in excess of the insured limit, it is a worry free form of investing. A CD is reasonably liquid and they are safe. Just like any investment option, it is not a good idea to have all your eggs in one basket. Stocks have been on a tear for the past few years, but that was after they got hammered in 2008 and 2009. The problem comes when retirees have allocated all their savings to CD’s and modeled their future on a 5% return and the “safe” market of T-Bills or CD’s does not meet their targeted yield. 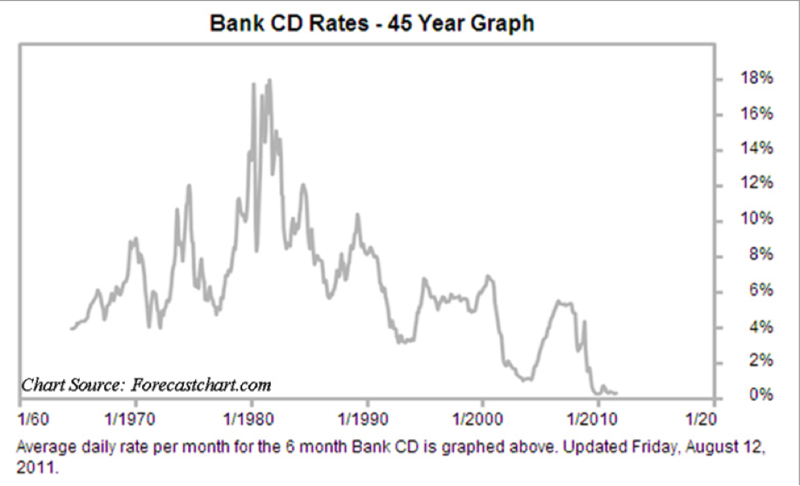 When you look at the graph above, it is easy to see why older investors have an affinity for CD’s. They have grown up in a period where their parents were adequately served by responsible saving and conservative investing. Beginning in the mid 60’s, CD’s marched down to negative inflation adjusted yields and spiked sharply positive (when Reagan became president) in the early 80’s and have drifted down ever since. No one knows which way rates are headed in the future; many think we will have massive inflation and many think we will deflate. What we do know is that we are living longer and typically spending more. We also know that not all investments are good all the time. The financial planner’s mantra of asset allocation and diversification is based on decades of experience and is very hard to quibble with. CD’s have a place in your portfolio as do stocks, bonds and alternative investments such as Trust Deeds, but none of them should be the only egg in your basket. Ever since the Hedge Fund industry has been snapping up thousands of distressed single family homes across the country, many savvy investors have decided to jump on the proverbial band wagon and follow suit. PHF has been providing some of those independent investors with purchase money for these “fixer/flippers” in the San Diego region for years. It’s a great business. Distressed homes are renovated thus providing sorely needed jobs and improving neighborhoods. When neighborhoods are improved, all values go up, so investors in these distressed single family homes (whether lenders or renovators) not only are making excellent returns on their capital or efforts, but they are bailing out the neighborhood and this is occurring across the entire country. As 2013 nears its close, the San Diego market has a shortage of inventory which has led to increased prices and lower margins in the renovation business. This in turn leads to fewer opportunities and lower yields for Trust Deed Investors. The latest quarterly data shows a huge jump in the number of homes that are no longer under water. This is a good thing on the macro level, but it warrants caution and stringent underwriting when it comes to placing your hard earned dollars on the line – it’s just not as easy as it was a year or two ago. As one reflects on the upcoming year and the standard options available, you must decide if the economy will stay steady next year or fall off another cliff. 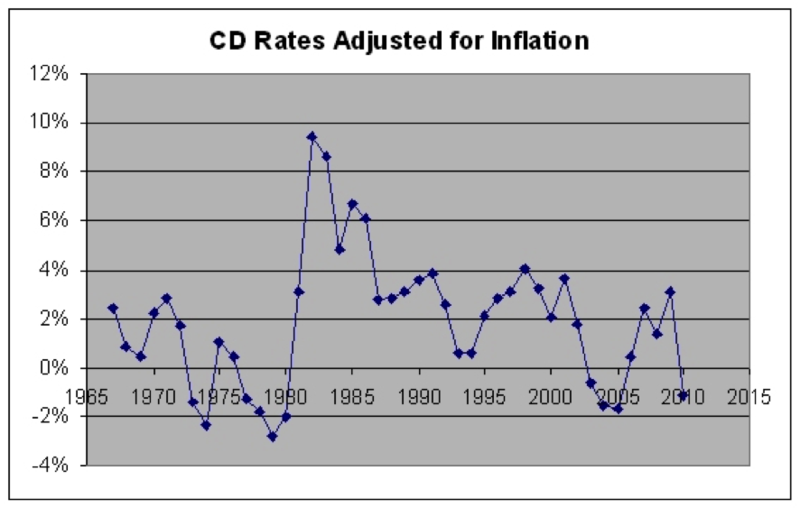 · CD’s or T-Bills are a good choice for ultimate safety, but the yield will not keep up with inflation. They certainly beat a negative return though. · Real Estate in general will suffer. · A stock market index fund would not be a good choice. The market is high and buoyed by the Feds cheap money and the Fed is threatening easing off on the money supply. This will drive up rates and drive the market down. Individual stocks are a separate matter; there is always a compelling reason to buy certain stocks that may thrive in a down market. · Bonds are not a logical choice. Since interest rates are very low, whether you believe the sky is falling or the economy will rocket up, odds are that rates go up and a vanilla bond play would is treacherous. · A very well secured 1st TD on a property you could stand to own for what you invested is a very good choice. The TD will weather all but the most ferocious fall, and even then, patience should bring back the value and even provide a bonus return. · Real Estate returns will depend on the “buy”, the type, and, as always, the operator. o Single Family homes could be good. New single family construction could be excellent. Industrial could be excellent as the economy improves. o Retail is very foggy since the impact of the internet (Amazon etc.) continues to explode. o Apartments continue to be the darling, but prices are high and cap rates low. · 1st Trust Deeds will be a great choice since collateral values will not decrease. These will perform as advertised and provide yields ranging from 6-12%. · 2nd TD’s always require diligent underwriting and are not for novices in any market, but certain instances arise that can warrant the additional substantial risk for the increased yield. As you can see from the above, the beauty of a Trust Deed – a 1st Trust Deed – is that it should perform admirably in whichever market 2014 brings. It is never going to match getting in early on a Netflix, Apple, or Amazon, but it’s strength is that it just chugs along relentlessly through thick and thin with a yield that is extremely competitive in the long run. What does SD’s all cash housing market mean? •Murtaza Baxamusa, directs planning and development for the Family Housing Corporation, of the San Diego Building Trades in Mission Valley:It is indeed unfortunate for first-time home-buyers that speculative buyers consist of almost a third of home purchases in San Diego. This is because the latter drive up prices, often come from foreign sources, and outcompete bids with traditional financing. Some may argue that the presence of cash buyers signals strong market demand. But speculative buyers have blown bubbles in the past, and this time may be no different. If housing costs spiral unsustainably faster than family incomes and local employment growth, homes become poker chips for international gamblers, than dwelling units for San Diego families. • Michael Lea, real estate professor at the Corky McMillin Center for Real Estate at San Diego State University: The high percentage of all cash transactions for San Diego County homes reflects the influence of investors in the market. Wall Street firms have created large funds to purchase homes – either to flip or to rent. Initially these funds focused on distressed houses but as that portion of the market shrank they turned their sights to non-distressed and higher priced homes. This reflects the volume of funds raised and the need to deploy the money. San Diego is an attractive investor market with significant appreciation potential given the depth of the downturn and lack of new supply. • Linda Lee, president of the Greater San Diego Association of Realtors: Thirty percent is common in many markets across the country. A recent National Association of REALTORS® study shows there has been a tremendous increase in cash buyers since the housing downturn. The study found more than 60 percent of international buyers pay cash for properties. Downsizing baby boomers often have enough equity left from their sale to pay for their next house or condominium with cash. We’re also seeing a larger percentage of cash buyers in the market because of tighter lending guidelines. Some clients have bought properties with cash and they finance after closing, so the buying process is less stressful. • Marco Sessa, chairman of the Building Industry Association of San Diego County and senior vice president of Sudberry Properties : There are several drivers for all-cash buyers. 1) The US dollar is cheap to foreign investors; 2) Investors are more likely to pay cash to maximize returns; 3) Move down buyers/empty nesters generally desire to lower their debt and they have significant equity from the larger home they are leaving; and 4) Other buyers who view debt negatively and are frustrated with low returns on other investments. As home values continue to rise and macro-economic conditions improve in the US, it is likely that the first two drivers will decrease and the number of all-cash buyers will return to more historical levels. • Robert Vallera, senior vice president of Voit Real Estate Services in San Diego: This attests to the health of our rental market. Many of these buyers are investors who are responding to the demand for rental housing. Unlike a decaying Detroit or overbuilt Miami, San Diego has enough economic vitality to create effective rental demand for our housing stock. An even larger factor is today’s Fed-suppressed interest rates. Cash savings generate almost no interest income and bonds are vulnerable to large capital losses when interest rates revert to historical norms. Rental housing investments with carefully controlled debt or no debt should provide a superior return to bonds with less interest rate or inflation risk. •Kurt Wannebo, real estate broker and CEO of San Diego Real Estate and Investments: First, it’s important to understand where most of this money is coming from. It’s both foreign and institutional, but in either case they are all mostly investors. My knowledge of these cash buyers is that they are all bullish on certain geographic areas such as Southern California. They are switching to buy-and-hold models, where in any case they will win. If interest rates rise, they will see rental income rise. If not, they anticipate valueappreciation on their investments. These are longer term strategies that investors are starting to feel, are a safer place to place money into. The primary finger points to Investors and I agree, but I don’t think foreign investors are the primary driver. Wall Street has had an impact, but my guess is that our local folks have been the primary participants. Since the historical average is 16% for cash buyers vs. the current 30%, that means that we now have twice as many cash transactions as the norm. Since most of the fixer homes are bought with cash; that makes sense. (PHF uses a TD for its fixer purchasers, but not all do. Many allow a purchase without a title policy and on the court house steps etc. and place the lien after the purchase.) These same houses are then quickly sold to end users and most of them use mortgages. Our dollar has risen over the last year vs. most other currencies and has discouraged many Canadian’s from buying this year vs last year. The exchange rate is worse and the prices have risen. Downsizing homeowners should be the same percentage in this market as the historical norm, so that is not a factor for an increasing percentage. Banks are certainly tougher, but normally you either have cash or you don’t, so again not a factor. Poor returns elsewhere is a possible reason, but a bond buyer is usually not a real estate investor. Moreover, low interest rates and leverage is a killer combo for real estate. So my conclusion is that our home town boys have been making an impact on the all-cash purchases and that is good news, but fairly irrelevant going forward. The metric lenders need to keep in mind is what is that house worth next year? My guess is that it will be at least steady, so it’s a good time to lend. Which Investment Yield is Better? 8% or 12%? It’s not that simple and it depends on your investment style as well as your source of funds. We just offered a great little $455,000 loan at a stunning 52% LTV and the response was minimal. That’s our fault for not explaining the benefits of this loan and for offering so many 12% loans and 20% Equity positions. Just because we haven’t lost a nickel on any loan we made in the last 5 years, doesn’t mean we are offering TBills at 12 or 20% – all loans have some element of risk. Our 10%, 11% & 12% flipper loans are great business. Great yield, provide jobs, make money. Super. But they take a lot of work, are short term, and produce hidden costs. If you do a 5 month loan at 12% and then get your money back out in one month and then do the same thing again, you have had 2 deals in one year, but 2 months of down time. Your annual rate of return is 10% not 12% because of the down time. You also have two files and two things to put in your tax return. You spent (I hope) at least two hours examining each loan. If you use IRA funds to do these loans, then you probably have a transaction fee to the custodian. If you like doing those things then it may be an advantage to you (I think it’s fun, but not everyone does). Moreover, if something went wrong with the deal, PHF will do all the work as a service to you, but you may have to advance funds to correct for cost overruns. This requires you to have back up funds to protect yourself and perhaps to take action that you did not contemplate. Once you decide it is a good loan, you are invested for the term. I have been in this business for 30 years and for 30 years I have heard “… I don’t want my money out for that long, rates may rise, etc”. Well for 30 years, private money rates haven’t changed much and for 30 years nobody wants their money back as long as they are getting payments. You have a family that has owned this asset for 12 years and the sons are contractors who will inherit this asset and they are improving it.